Until very recently, solar power was paying off for a very exclusive club in Los Angeles. Despite a 30% federal tax credit on out-of-pocket costs of solar installations and a $0.13/KWH California Solar Initiative (CSI) rebate on solar panel installations, Los Angelenos weren't buying. They were, however, paying. Just 67 residential solar systems were installed in LA during the first three months of the LADWP's Solar Incentive program (Q1 2008) -- out of the LADWP's base of 1.4 million residential electricity customers. This small number of solar installations has been largely due to previous LADWP restrictions requiring property owners to purchase and own their solar panel systems in order to qualify for the state rebate. 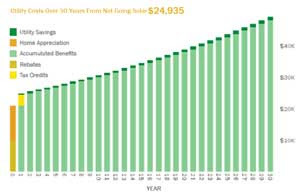 Thus savings on solar electricity have tended to be greatest for homeowners with large, unshaded rooftops and high electricity bills -- and large corporate customers. The LADWP has been collecting an average $12/year from residential consumers to pay for its solar rebate -- as required by Arnold Schwarzenegger's signature Million Solar Roofs (SB-1) legislation. Million Solar Roofs funding, in the form of an LADWP rebate, is designed to ensure that homeowners realize a positive cash flow in energy savings from day one, and that consumers will receive consistent and ongoing monthly savings in energy cost reductions and mortgage interest tax savings over an average 25-year life. Through community activism and the support of clean energy advocate Councilman Bill Rosendahl, Los Angeles residents have been successful in changing LADWP policy to ensure that Million Solar Roofs funding is now available widely to hundreds of thousands of Los Angeles residents. Under the new LADWP policy, the nation's leading solar installers are now offering solar panel installations with immediate savings for consumers. Mar Vista resident James Brennan has decided to go solar as part of the Mar Vista program and shared details of the savings he will receive from switching to coal-free solar power. After completion of his initial solar assessment, Brennan learned that his roof can fit enough solar panels to generate 2.87kW of DC power, for which SolarCity would charge $21,036 after a group discount of $500. With Million Solar Roofs funding, the LADWP Solar Incentive rebate will reduce Brennan's out-of-pocket expenses on his solar purchase by $9,603, bringing his out-of-pocket total down to $11,433. A year-end Federal Tax Credit will return Brennan an additional $3,430, resulting in a net system cost of $8,003. Brennan's current LADWP electricity bill averages $75 per month. The new solar panels will offset his existing utility bill by 62%, bringing his monthly cost for coal-powered electricity from LADWP down to $29 per month. Brennan's 2.87kW system is expected to result in electricity savings of $569 during the first year. The system will provide a 7.2% return on Brennan's investment over 30 years. And the solar panels will offset Brennan's total carbon output by 146,798 lbs. With the new LADWP policy changes allowing third-party ownership of solar installations by Los Angeles residents, Brennan can now avoid the initial $11,433 cash outlay to receive the benefits of the same solar panel system without any upfront costs. SolarCity will install Brennan's 2.87kW system without requiring him to purchase it. Brennan will pay $0 upfront to have the system installed, will receive free service for 3 months as part of the Mar Vista group discount, after which he will make a monthly payment of $34 for use of the system over a 20 year period (with a 0% annual increase). He will continue to pay a reduced LADWP monthly electricity bill of $29. Brennan's total monthly electricity bill will drop from $76 to $63, which includes both the lease payment and reduced LADWP bill. Brennan's system will generate an estimated $6,241 in savings over the 20 years, with an immediate payback. The SolarCity lease includes guaranteed inverter replacement, if necessary, and extended warranty and repair of the system over the 20 year period. In addition, SolarCity guarantees the system will produce the full 2.87kW of solar electricity as part of the lease. Brennan has the option to renew, upgrade, or purchase his system at the end of the lease -- or SolarCity will remove it at no charge. Solar panel technology is advancing quickly and Brennan hopes that after twenty years, upgraded panels may be able to offset more of his electricity bill. As an additional benefit of the Mar Vista program, Brennan will receive a free rooftop wireless Internet connection to the neighborhood Wi-Fi network. By subscribing to the 5mbps neighborhood Wi-Fi service for $10 per month, Brennan could save an additional $30 over a comparable-speed broadband cable service from Time Warner. Or he could choose the free 1mbps Wi-Fi service for savings of $20 per month over a similar speed cable service. Along with Mar Vista resident John Ayers, Brennan is an organizer of the GoSolar Mar Vista campaign for 100% clean electricity in Mar Vista by 2018. The group hopes to double residential solar panel installations in Mar Vista from 35, with another 35 participants in the program. The group points out the recent changes in LADWP policy allowing such affordable solar panel installation are still not yet widely enough available for the community to reach 100% clean energy. GoSolar Mar Vista is holding an interactive webcast on Tuesday September 15 at 6pm to promote awareness of both affordable solar and home energy efficiencies that can reduce overall use of coal-powered electricity. The GoSolar Mar Vista campaign is advocating for additional changes in LADWP policies that will make solar panels affordable to residents of apartment buildings and condominiums, and neighborhood businesses for installation on their rooftops and shaded parking lots. Organizers also hope to see solar panels installed on its local US Post Office building, neighborhood LAUSD schools, and other municipal buildings including the Mar Vista library and recreation center. GoSolar Mar Vista organizers will be particating in a demonstration on Friday September 18 to draw attention to a new Community and Emergency Response center in the neighborhood, where residents are advocating for solar panel installations. Mayor Villaraigosa's 2008 "Solar LA" energy plan for Los Angeles calls for a number improvements, though many of the key provisions have yet to be implemented. * Urge the California State Senate to expand affordable solar with net-metering. * Sign the Sierra Club petition for a coal-free Los Angeles! * Tell Congress no more coal power plants.